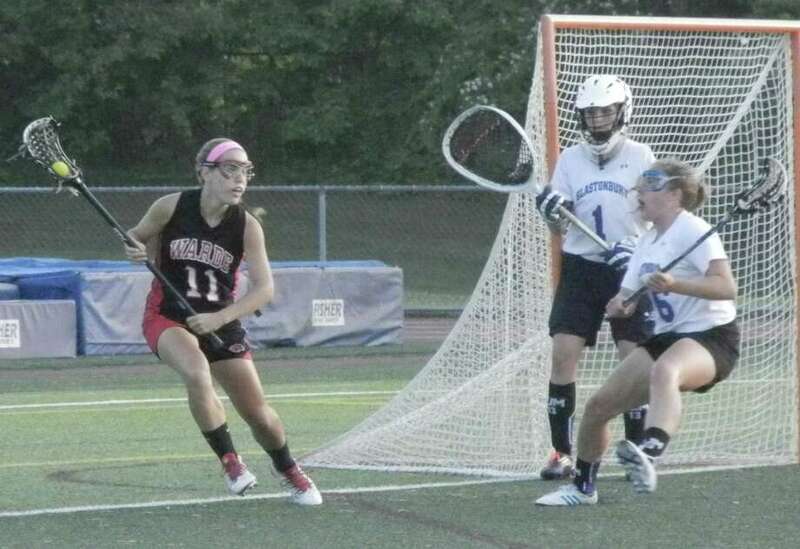 Any momentum carrying over for the Warde girls lacrosse team from its win that propelled the Mustangs into the CIAC Class L semifinals five days earlier was wrested away by a determined Glastonbury team on Tuesday night at West Haven High School's Ken Strong Stadium. The undefeated Tomahawks, seeded first, established superiority right away at draw controls, and their swarming defense, speedy transition game and smooth attack took care of the rest. Glastonbury beat the Mustangs 13-5 -- after scoring the first seven goals -- and reached Saturday's state championship game at Bunnell against defending champion Darien. The Blue Wave defeated Cheshire 12-6 in West Haven in the afternoon. Fifth-seeded Warde trailed by 7-1 at halftime. The Mustangs' bid to rally in the second half was delayed until the 15th minute of the second half as the cohesive Glastonbury defense had refused to relent. By the time Warde sophomore Amanda Orvis notched the second of her three goals, the Tomahawks (19-0-0) had clicked off another two scores for a 9-1 lead. The Mustangs' next goal came after Glastonbury, the regular-season champions of the CCC, had moved ahead by 13-2 with 6 minutes and 36 seconds remaining. Glastonbury returns to the finals for the first time since its 2011 loss to Greenwich and for the second time in its history. Warde missed out on its first chance to reach the championship game, but its 13-6-1 final record and its initial appearance in the semifinals put an exclamation mark on its best-ever season. "Sarah Reilly, Meredith Nerreau, Amanda Orvis, and others from time to time, they all stepped up their games at different times this season," Warde coach Tom Davis said. "The future looks bright. The seniors never game up at any time this year, so no one else (underclassmen) gave up." Three Tomahawks had big games Tuesday by supplying five points or more. Senior Cami Santor paced the attack with four goals and two assists, junior Sara DiCenso provided a goal and five assists and junior Taylor Walker fired home five goals past Warde sophomore goalie Rebekah Snitkoff, who made seven saves. "The reality of the matter is that they are an FCIAC team," Glastonbury coach Kris Cofiell said. "Darien, Greenwich, Wilton and New Canaan are the top teams there. This season, Staples and Warde have come on the scene. You've got to look at them as strong teams." Glastonbury was prepared for a difficult game, she said. But the Tomahawks' defense made the anxious moments few and diminishing in intensity as their offense kept rattling off goals. On the season, Glastonbury's offense has approached 20 goals more times (11) than it has been held to close to 10 goals (four). In only two other games had the Tomahawks' attack produced fewer than the 13 it scored against Warde. But Glastonbury's defense was the driving force in the game. "It felt like on defense, we finally came together today," said Cofiell, who noted how injuries had kept her starting defenders unable to be on the field together for awhile. Davis credited Glastonbury's defense with putting pressure on Warde's attack. The Mustangs were out of synch for long stretches of the game. "Whenever we'd turn our backs, they'd be double- or triple-teaming the ball," Davis said. "We knew that was going to happen and we practiced it, but game situations are different from practicing against it. We just didn't get it done today." Of the 29 players on the Mustangs' tournament roster, five were seniors, including captains Caroline Lambert and Gabby Howard, seven were juniors, 10 were sophomores and seven were ninth-graders. Records: Fairfield Warde 13-6-1, Glastonbury 19-0-0. Scoring: FW--Amanda Orvis 3 goals, Caroline Ihlefeld (1g), Meredith Nerreau (1g), Courtney Scheetz (1a), Kelly Milicia (1a); G--Cami Santor (4g, 2a), Sara DiCenso (1g, 5a), Taylor Walker (5g), Lindsay Shettle (2g, 1a), Julia Ostrowski (1g), Madeline Norman (1a). Goalies: FW--Rebekah Snitkoff (7 saves); G--Audrey Apanovitch (4). Shots: FW--14; G--26.